I totally called it. Not like that is any great feat. So, we have the finals with Detroit vs Pittsburgh. Okay, time for predictions...or guesses, whatever you want to call it. 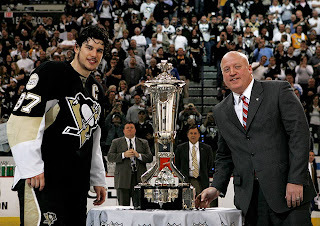 No team as ever won the cup with a non-Canadian captain. Nicklas Lidstrom is from Sweden...of course he is the first European born player to win the Conn Smythe, figure that one out. The Red Wings also have Henrik Zetterberg (also a Swede) and Pavel Datsyuk (Russian), these two are not human...like Lidstrom, they are European. In fact, I think Detroit is somewhere in Eastern Europe, and not in Michigan.Those are just the guys everybody knows about. I do not follow the team so I have no idea how is on the team. The depth on this team is...well, deep. Detroit was first in their division eleven out of their last sixteen seasons (excluding lockout). The other four? They were second. Since the last time Detroit won the cup in 2002, they have been the team to beat, literally. The four teams that beat them in that span went on to the Stanley Cup Finals (Mighty Ducks 2003, Flames, 2004, Oilers 2006, Ducks 2007). Three of those four teams went to Game 7 only to come up short, while the Ducks won it all last season. That is an incredible statistic...because I said so. So here is my prediction. Just like the NHL, I want Pittsburgh to win it. But, we all know that Detroit is going to win this thing. I will be surprised if the Penguins even come close. This will be a 4-1 series...so Detroit can have the Cup at home. Now, it would be great to have a young team like Pittsburgh win and I am all for that. Plus, as a bonus, I get to see Gary Roberts hold up the Cup again. Simply put, 'you gotta beat the man to be the man', and right now Detroit is the man...uh, machine. Game 1 is Saturday in Detroit. Do penguins eat octopi?